Cypress Tees, LLC joined forces with America's WETLAND Foundation’s Conservation Corps to help with Louisiana’s oil-damaged marshes. By donating 30% of the proceeds from the sale of all ‘Bird of Paradise’ t-shirts or rompers, Cypress Tees is helping AWF’s restorative planting efforts to begin rebuilding Louisiana’s damaged coastal nesting grounds and habitats. Cypress Tees feels the best way to help is to look to the future and team up with a reliable, responsible group like America's WETLAND, who will work to rebuild and restore the beautiful and vital areas of coastal Louisiana we all cherish. 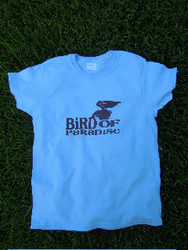 The 100% cotton shirts and rompers are light blue with a chocolate brown design featuring the Brown Pelican nesting on the words ‘Bird of Paradise’. Adult shirts sell for $21; youth shirts and rompers are $18. All are available through the company’s website, http://www.cypresstees.com. Located in Lafayette, Louisiana, Cypress Tees, LLC designs and sells fun, 100% cotton t-shirts celebrating Southwestern Louisiana. The company is owned by local residents Wendy Begneaud and Gretchen Durbin. America’s WETLAND Foundation’s Conservation Corps is an LSU AgCenter-based AmeriCorps program which manages volunteers and is conducting restorative plantings in the wake of the Gulf Coast oil spill. For more information regarding America’s WETLAND Foundation please go to their website: http://www.americaswetland.com.